"Top End & Kimberley Explorer"
This package allows you to explore the Kimberley & Top End in the safety and comfort of a a purpose built small group 4WD. Your guide is professional and knowledgeable and your stay in remote wilderness areas are in a combination of purpose built safari tents and luxury accommodation. Please note: Package runs Darwin to Broome as well as Broome to Darwin - Refer Dates Below!! 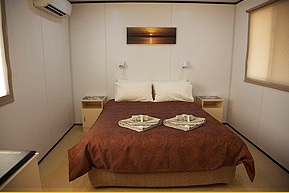 Arrive in Broome and be transferred to your hotel. Discover all that Broome has to offer or relax on Cable Beach as you enjoy your day at leisure. There are a number of remarkable and poignant sites to visit in this historic pearl diving town. Indulge with a delicious Welcome Dinner and meet your fellow like-minded travellers and Driver-Guide. Departing Broome, view the Boab Prison Tree near Derby. The hollow trunk of the Prison Tree was used as a prison cell during the region’s early days. At Geikie Gorge discover a stunning waterway hemmed by sandstone walls that have been bleached by annual flooding. Cruise the gorge guided by a traditional Bunuba land owner. Our first stop is Tunnel Creek, a 750 metre-long natural tunnel carved through the Napier Range. With torch in hand, you can wade through the cool waters under the mountain range to view the oasis that awaits on the other side. At Windjana Gorge, sheer cliffs tower above white sands and ancient marine fossils are embedded in the gorge walls. Look out for freshwater crocodiles lazing on the banks of the Lennard River which runs through the gorge. Then we begin our journey on the famous Outback highway, the Gibb River Road, continuing on to our exclusive camp, in the heart of Ngarinyin country. Back on the Gibb River Road we travel to Bell Gorge, where rugged cliffs surround a series of tiered waterholes. The afternoon is yours to explore. Enjoy a swim below the waterfall, go birdwatching or choose from a number of hiking opportunities. This is the perfect place to simply relax and enjoy the surroundings. Head back to camp. Travel through Kimberley cattle country, discovering secluded gorges. At Galvans Gorge, a short walk leads to a picturesque waterhole. Inspect the gorge’s rock art and take a swim. At Barnett River Gorge enjoy lunch under the paperbark trees. Look out for birdlife and take another dip. We then head towards the isolated Mitchell Plateau. Ascending the Mitchell Plateau, we enter a world of Livistona palm forests, ancient Aboriginal art, magnificent waterfalls and isolated swimming holes. Today, explore Wandjina and Gwion (Bradshaw) art galleries and swim in crystal-clear waters at King Edward River Crossing. Relax at our exclusive wilderness camp beside Camp Creek at the top of the plateau. Today discover the beauty of Mitchell Falls. When available, local Aboriginal guides will join us, imparting their knowledge of the area. Begin with a guided hike to Little Merten Falls to view rarely seen Aboriginal art. Continue on to view Gwion (Bradshaw) art and Big Merten Falls before arriving at Mitchell Falls. Here swim in the river above the falls and discover the wildlife. Take a helicopter flight over Mitchell Falls back to the vehicle (or, if you prefer, hike back with your guide). Longer flights over the remote coastline are available at an additional charge. Leaving the magnificent Mitchell Plateau, we rejoin the Gibb River Road and ford the Durack River, named after the region’s most famous pioneering family. Then ford the Pentecost River where saltwater crocodiles inhabit the deceptively calm waters, before arriving at El Questro Station and Wilderness Park – one million acres in the Kimberley wilderness. Today discover the wonders of El Questro. Cruise Chamberlain Gorge, a fresh waterway fringed by tropical vegetation and rugged escarpments, with a ranger. You’ll also see rare Wandjina Aboriginal rock art at the gorge. This afternoon walk to beautiful Zebedee Springs to soak in the natural thermal pools, surrounded by lush ferns and palms. After a leisurely soak, hike to Emma Gorge and indulge in a refreshing swim over to the towering droplet waterfall. Farewell El Questro and journey to World Heritage Purnululu National Park, a spectacular wilderness region. We travel the rugged Spring Creek Track into the Bungle Bungle Range. Enjoy a drink while the sun sets over the Bungle Bungle. Discover the magic of Purnululu for yourself. Virtually unknown to white Australians until 1982, the park’s remoteness is equalled only by its untouched, mysterious beauty. Hike into Echidna Chasm, a spectacular cleft in the rock massif. Continue on to Piccaninny Creek and the natural amphitheatre of Cathedral Gorge. Walk among the beehive domes as your guide brings the natural history of the range to life. Learn about bushtucker, bush medicine and the area’s significance to local Aboriginals. Travel to Kununurra and tour the Ord River Scheme, which was constructed on the river in 1963. The scheme was established to harness the wild, tropical rivers of Western Australia so that the water could be used for irrigation and electricity production. Departing Kununurra we cross the border into the Northern Territory. Pass the tiny town of Timber Creek en route to Nitmiluk National Park. The traditional home of the Jawoyn people, Nitmiluk’s 13 stunning gorges were carved from red sandstone over the course of 20 million years. Experience a memorable sunset cruise through the towering cliffs of Katherine Gorge. Your guide will detail the region’s rich flora and fauna, and explain the significance of the gorge’s Aboriginal art. Travel into World Heritage-listed Kakadu, the Northern Territory’s best known national park. Rich in flora, wildlife and beautiful scenery, it’s home to more than 5000 rock art sites and up to one-third of all Australian bird species. For these reasons, the park is one of the few World Heritage sites that is listed for both its cultural values and natural features. Explore Gunlom waterhole and enjoy a relaxing swim. Join a guided cruise on Kakadu’s Yellow Water billabong. Cruise along the tranquil waters as your guide provides commentary on the region’s natural history, abundant flora and wildlife. Keep an eye out for fearsome saltwater crocodiles. Then visit the Warradjan Aboriginal Cultural Centre and gain an insight into the cultural and historical significance the park holds for its traditional owners. We travel to Nourlangie Rock to view Aboriginal art. The Aboriginal art in Kakadu is remarkably different to what has been discovered in the Kimberley. As well as X-ray style paintings, there are also Mimi paintings (depictions of delicate spirit figures), believed to be older than the X-ray style. An easy hike from Nourlangie leads you to Nanguluwur art site. Visit the Bowali Visitor Centre and learn about the local region and its wildlife. Accompanied by Aboriginal guides, explore the East Alligator River on the Guluyambi cruise. We travel to Ubirr, to see the superbly preserved Aboriginal rock art. Ubirr features one major rock art gallery and some 36 smaller sites. Journey across the Marakai Plains to Darwin. Your adventure comes to an end today as you are transferred to the airport for your flight home. 2 night Safari Tent with linen provided. facilities include nearby dining room showers & toilets. 2 nights Safari Tent at Emma Gorge with ensuite and nearby bar & restaurant. 2 nights at the Kununurra Country Club. 2 nights Deluxe Safari Tent with wooden timber floor own ensuite. 1 night at the luxurious Cicada Lodge . With beautiful Cable Beach, sunshine and idyllic weather, Broome offers the perfect start or end to your Kimberley adventure. So why not take advantage of our special pre and post tour accommodation rates. If you can extend your stay to include an extra day or more in Broome, we can offer reduced rates on all of our Broome Tours and Activites. If you are contacting us via phone, email or through a travel agent please let us know which accommodation and tours you would like to prebook. If you are booking online we liase with you as part of the confirmation process and will capture your request then.